The World of Althéa: It's For You! I can now show you some of those scroll images that Geoff Cordery (Quillmaster) managed to put together for me. (Thanks Geoff.) He did half a dozen images for me (one special one just for the campaign), but I will only show a few of them here (and especially not the special one) to give you an idea of how they look. The good thing about these scroll images is that they are around 700 x 700 pixels, which means they are already a good size to display on screen, without the need to blow up and cause them to pixelate. Scroll images are now available at the Vault. The screenshots show the whole screen so that you get an idea of how big the scroll GUIs are. In the end I had to slightly alter the XML that displayed these GUIs because the close button and text displayed would not quite match up for each type. I think the differences and slightly extra work were worth it though. Of course, I could leave the close button off altogether and just let the player hit the escape key, but I have currently left it in just in case the player has more than one GUI open at the time. 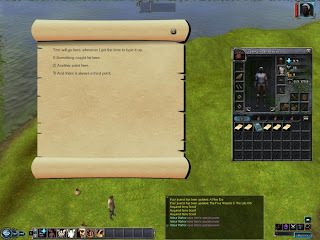 These scrolls, like my Readable Books, allow for a journal entry to be updated after being read, and so they are quite useful to put across plot points for the players. I decided not to attach a number of other events to these for the time being, but there is no reason why they could not have all the events as used in the Readable Books. I have also managed to put together some of the PC background section that is set by players at the start of the module to help set the scene for both them as a player and for their PC. I wanted to allow both players of Soul Shaker and those who come along new to be able to start in this new era of the campaign, and so devised a "Background" GUI that requires one answer from a player that sets the game up for them. 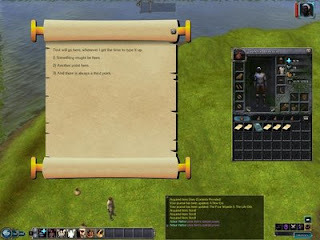 Depending on their answer, the player will have their PC know more or less about events at the start of the game. Furthermore, the same answer will steer the player into learning more about the story before they get underway. This is something that I had to do in my released Readable Books and Captured SpellBooks. The Vault versions have now been updated to v1.02 to reflect this new code that makes them companion compatible. And now that I know this, of course, it is something I will keep an eye out for. As a further side to this, I now recognise the important distinction when coding between the Main PC and a Companion in other ways too. For instance, journal entries activated by a companion do not show in the companions journal - at least not in the settings I have tried. This is not a problem of course, as long as the player is aware of this and checks their Main PC's journal for updates instead. 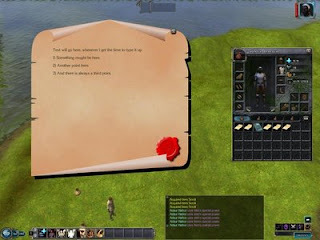 It is possible to iterate between all the companions to update their journals with extra code as well, but I decided to simply add one entry to the companion journal effectively saying check the leader's journal instead. There is a point of note for the player here as well, in that while they may play more than one character (via using companions), it is still their Main PC (acting as a sort of leader for the small group) who determines many of the major points for the small group. This is obvious in hindsight, but is still worth mentioning so that players are aware. E.g. If the leader does something to affect their alignment, then the player should note that supporting companions are also said to be "going along" with their leaders choices and have their alignments shifted at the same time. In other words, some actions played by the leader affect the whole group. Furthermore, even acts committed by a companion count as if they had been "ordered" to do so by the leader (Main PC) and so the whole group are affected together. In fact, in this sense, while the PCs may be individuals, some of their actions count as if they affect the group as a one whole. I did wonder why I did not receive a comment from you at the time. ;) Better late than never. Did you like my area design in the latest blog?